Wouldn’t it look beautiful on your Easter table? Colourful, pastel, and perfect for celebrating the beginning of spring. I actually wasn’t sure how the colours would come out after baking, but they turned out beautifully! 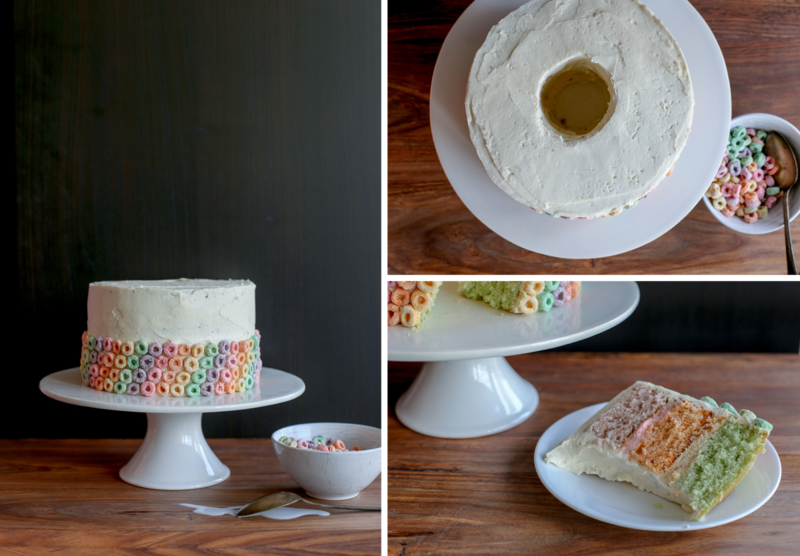 And yes, I sorted a box of Froot Loops to make this cake. It was surprisingly relaxing and is also a perfect job to keep kids occupied while you bake. And if you have kids, maybe you already have a box of Froot Loops lying around the house. Though it looks fancy, it’s actually no harder than making a regular old vanilla cake. Take as much or as little time as you want decorating. Be precise or haphazard. 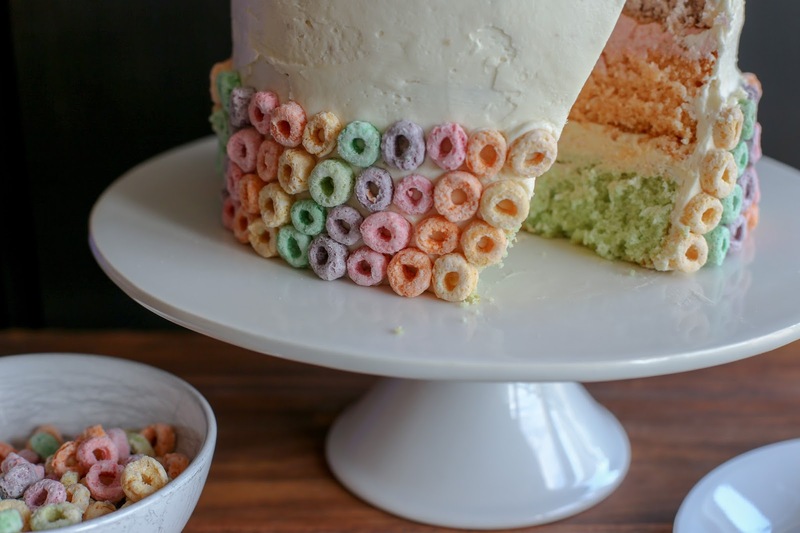 There’s no rules when it comes to cereal cakes except to enjoy. 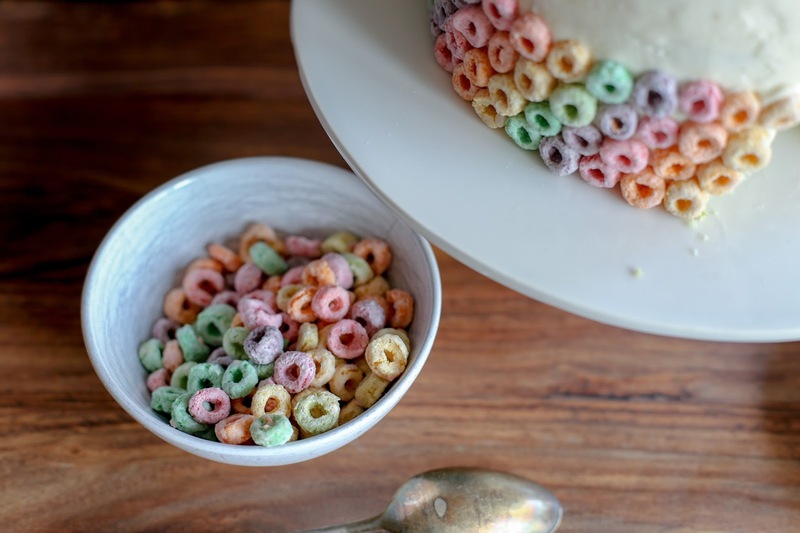 In a food processor or spice grinder, grind about 1 cup of each colour of Froot Loops into a fine powder. Save some whole for (snacking on and) decorating the finished cake later. Preheat oven to 350F. Prepare 3 x 7” cake pans by greasing them using butter or shortening (I like to use shortening because it’s nice and soft and doesn’t cause cake edges to get crispy), lining the bottom with a parchment paper round and greasing that lightly as well. Flour greased cake pans. In a medium bowl whisk together egg whites, 1/4 cup of milk, and vanilla. Set aside. In a large bowl or the bowl of an electric mixer whisk together dry ingredients. Using a hand mixer or the paddle attachment of your stand mixer, add the butter and remaining 1/2 cup of milk to the dry ingredients and mix on low speed until just moistened. Increase to medium speed and mix for 90 seconds. Add the egg mixture in 3 separate batches, beating for about 20 seconds and scraping down the sides of the bowl with a rubber spatula after each addition. Divide the batter into 3 bowls, ideally weighing with a kitchen scale to get even layers. Add 2-3 heaping tablespoons of ground up froot loops to each bowl and stir gently until incorporated. 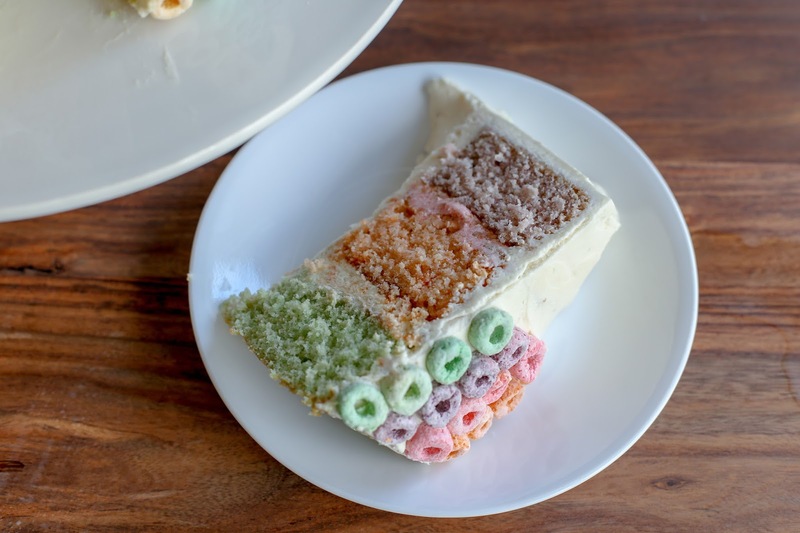 To get the colours I got, use the green, orange, and purple colours in the cake layers. Scrape the batter into prepared pans, spreading to even the tops. Bake cakes for 25-35 minutes in the centre of the preheated oven or until a cake tester comes out clean when inserted into the center. Do not overbake or the cake will come out dry! You can check it as early as 20 minutes (but not before) and once you feel it’s close, use 2-3 minute intervals between checks. Let cool on wire racks for 10 minutes before loosening the sides with a small metal spatula or knife, and inverting onto the wire racks. Gently turn cakes back up, so the tops are up and cool completely. If you don’t have a stand mixer, you’ll get tired and sore making this frosting. Proceed at your own risk. In your stand mixer fitted with a paddle attachment, whip butter on medium speed for 8 minutes, until white and very smooth. Add the rest of the ingredients and mix on low speed until combined. Increase speed to high and whip for 6 minutes. 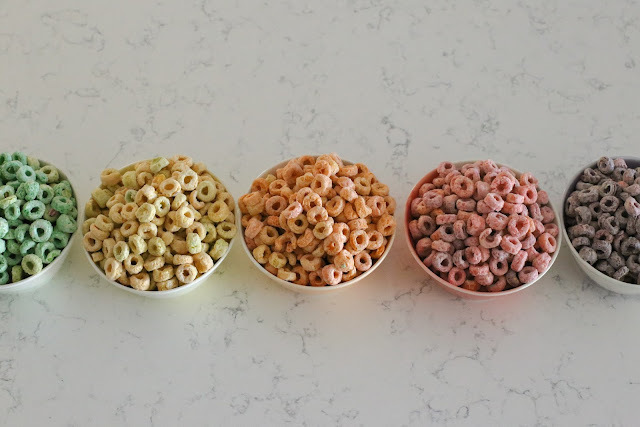 Place 1 cup of frosting into each of two bowls, add 2-3 heaping tablespoons of ground froot loop powder (yellow and pink), and mix until combined. Leave the remaining frosting as white. If you want the hole in the centre of the cake, use a biscuit cutter to cut a 2 inch circle out of each cake layer. If your cutter is not tall enough, use a round cookie cutter to mark the circle and then use a knife to cut the circle out of the cake layer. Starting with the green cake layer, spread the yellow frosting on top. Stack orange cake layer on top and spread with pink frosting. Finish with the purple cake layer. 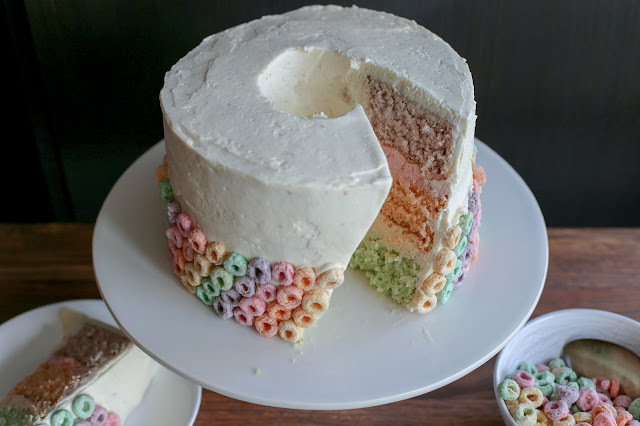 Using the white frosting, frosting the whole outside (and inside the hole) of the cake, using as much or as little frosting as you like. 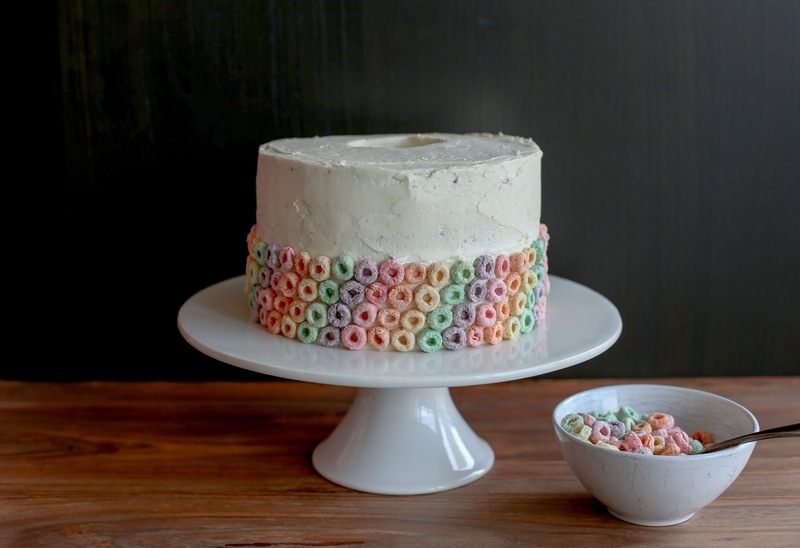 Use leftover whole froot loops to decorate the cake. 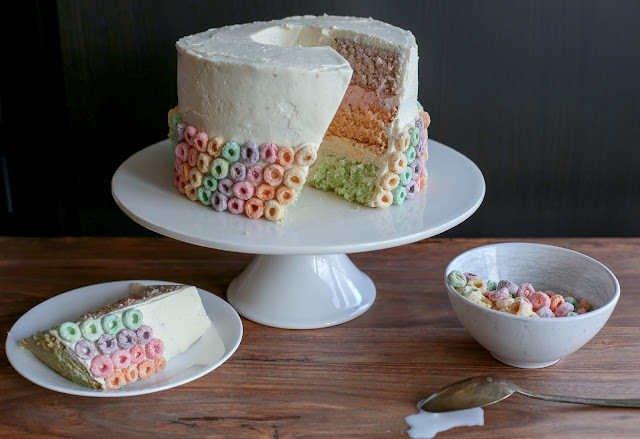 For the effect I got, create a colour pattern of froot loops in a ring around the bottom of the cake. For the next row, place the froot loops above the gaps in the layer below, so each colour line becomes diagonal. Continue about halfway up the cake.